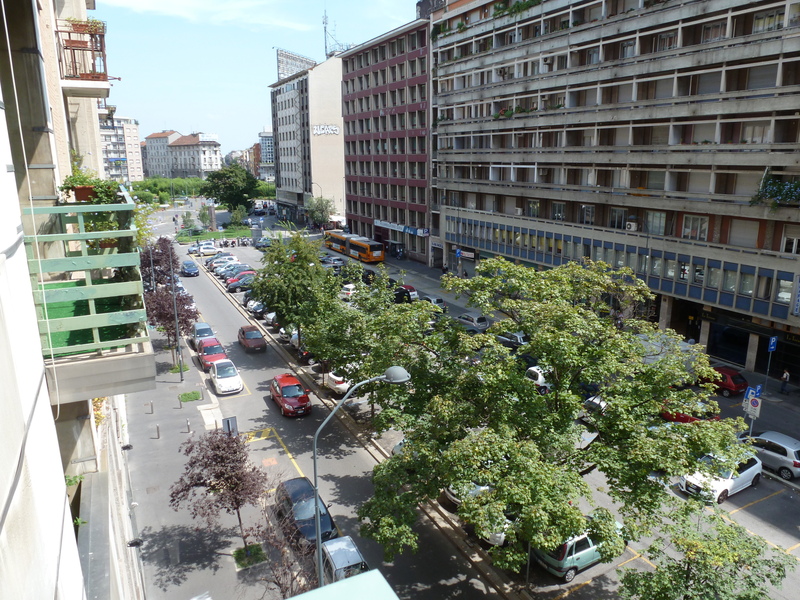 On my first evening in Italy, I sit outside my room on the 3rd floor balcony that overlooks the Viale Andrea Doria. Straight ahead, a neon yellow sign proudly displays GRAND HOTEL DORIA high above the old stone rooftops. The moon is almost full. It is the same moon that will shine down in America, hours from now and miles away. I sit here in comfortable solitude as I piece together the events of the day. I remember my seat mate on the airplane, Chelsea, who drinks a glass of red wine while finishing the last tantalizing chapters of Gone Girl. She is kind, a graduate from UVA Law, who just finished the Texas bar exam and is finally taking a well-earned vacation with two of her law school friends. She is the kind of girl who saves her brownie from dinner for a late night snack and asks me questions about my upcoming trip. Chelsea and her two friends will later “adopt” me into their friend group as we navigate the bus system, train station and correct destinations. Thank you to those young women. And thank you to the New Jersey father who used his precious cell phone data to look up the directions to my hostel and allowed me to write each one down so I wouldn’t get (too) lost. Thank you to the Australian girl, Kelsey, who is occupying one of the six bunks in my room tonight. Dinner was great. Your 24-year-old confidence as a traveler and explorer of the world is inspiring. I hope you get to reunite with your Irish boy sometime soon. 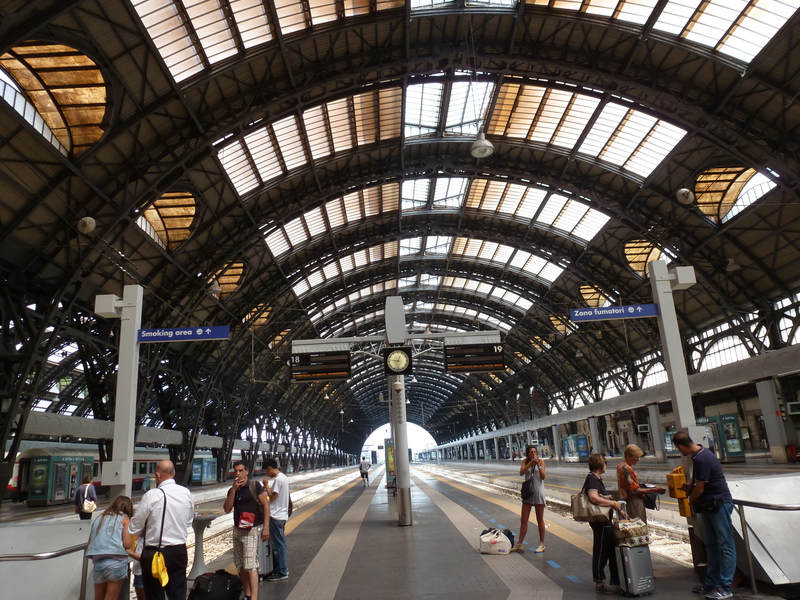 Milan is first and foremost an international city. I was surprised by my lack of culture shock, more closely resembling my slight discomfort in New York City than the more isolating awareness I usually feel in a foreign land. People of all races, heights and body types weave their way through busy crowds and frantic shoppers. English is written on signs and spoken by a number of business owners.The buildings here in Milan, however, have more character and less height than the Manhattan skyline. 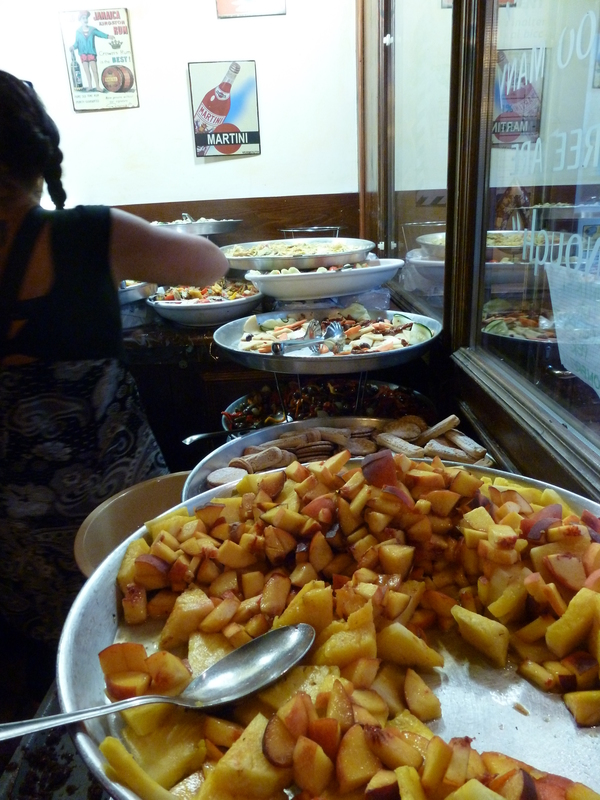 Piazzas with fruit trees or bike rentals are sprinkled throughout the city. Pedestrians, mostly women, enjoy their multi-colored gelato with long extravagant licks. And the shopping! Go down Venezia Buenos Aires (located along the red line) to get an idea. I walked for 25 minutes past store after store selling shoes, sunglasses, perfume, clothing and more. Prices ranged from incredibly cheap to high-end luxury goods. It took all the willpower I hate to only purchase a pair of sunglasses. 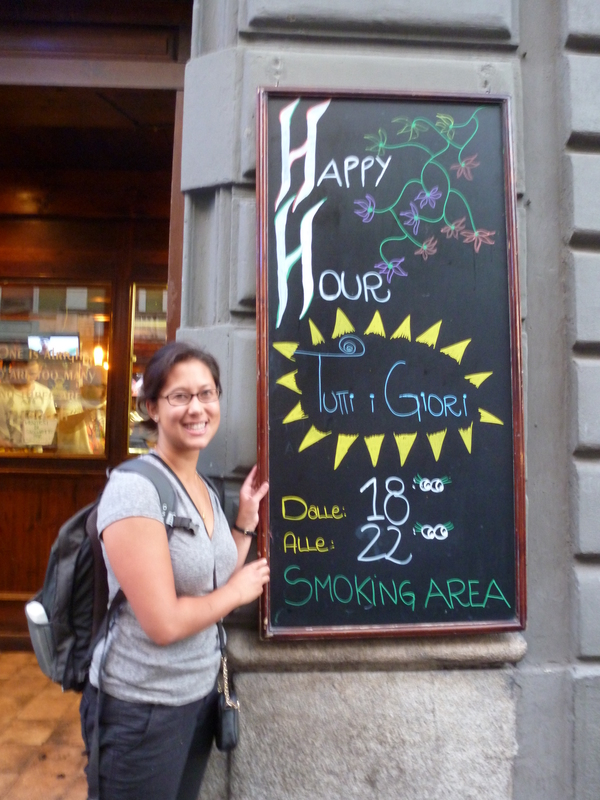 For food, I suggest checking out Milan’s Happy Hours. These deals usually run from 6pm-10pm. For the price of one drink (cocktail, beer, wine), you have access to an all-you-can-eat buffet bar. Tonight I sampled a variety of dishes include seafood paella, pizza, pasta, salmon, roasted potatoes, olives, cheese, fruit and chocolate cake for dessert. The bill? Only €9. For culture and art, Milan is probably most famous for Da Vinci’s The Last Supper and the Duomo di Milano, both located at or near the center of downtown. The Last Supper will require advanced reservations so book ahead. Travel well, travel far. Write us of your adventures and have fun. Thank you so much Peter! I will bring you with me virtually. Can’t believe it’s almost been a week! I am so excited for you and look forward to traveling with you through your blog. Soon we will experience Italy too. You are certainly helping to build our excitement. Safe travels and have fun!!! Thanks Lori! I can’t wait for you two to come and have an incredible vacation. I just arrived in Genova on the start of my Italian tour…there is a chance I might see you in Rome! That would be amazing and so much fun!! I’ll keep my fingers crossed.